Hearkening back to her 'Scanagram' days, Deborah Pinter's latest printmaking endeavor is proving that she is evolving. Using algraphy - which utilizes a corn-surfaced aluminum plate versus using stone - Pinter is able to obtain a richness and depth unlike anything seen before. The focus of the works in this exhibition are from the time periods leading up to, during, and following a five-week residency at the Grafikwerkstatt Dresden Studios in Dresden, Germany. Photographer and Printmaker Deborah Pinter was the latest recipient of Zygote Press’ five week-long Dresden Exchange Residency. This exchange is the longest-running program not only at Zygote Press, but also in the state of Ohio. Funded by the Ohio Arts Council and the City of Dresden, the exchange lets artists from Ohio and Dresden become acquainted with the art and artists of another community, provides time for the artists to explore the printmaking resources available in those communities, and continues to strengthen artistic relationships between both locations. Deborah's work for this exhibition is proudly shared with us through her gallerist Ron Rumford and his gallery Dolan Maxwell. Cleveland native Deborah Pinter has always had an eye for detail. Starting out with a BFA from the Cleveland Institute of Art majoring in photography, her camera-ready self did a joint-graduate program at the New York University/International Center of Photography. Returning home was an easy choice, due to her involvement in many local artistic causes like SPACES Gallery, and the Friends of Photography Group and Print Club connected to the Cleveland Museum of Art. Her most recent passion is to the Cleveland Print Room where she is on the advisory committee. She is in the collections of the Cleveland Museum of Art, Zygote Press Archives, Progressive Art Collection, The Cleveland State University Art Collection and the Laura Ruth and Fred Bidwell Collection, in addition to many corporate and private collections as well. Her latest algraphy prints from her residency in Dresden, Germany marks a shift in tone from earlier work, and Deb is excited at the prospect of continuing this journey that has her traveling the world. Her journey was provided with the opportunity to spend five weeks as part of the Dresden Residency Exchange Program through the Ohio Arts Council and the City of Dresden. 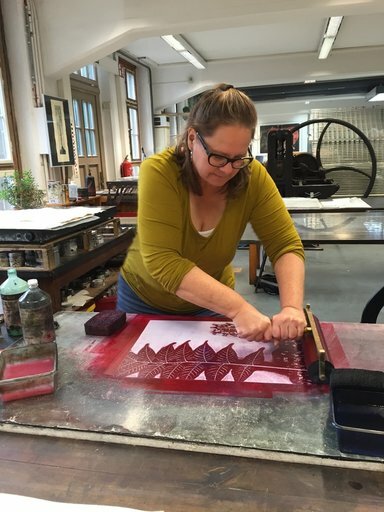 This opportunity allowed Pinter to work with master printmakers at the Grafikwekstatt Studio in Dresden, Germany. ​You can learn more about Deborah on her website.